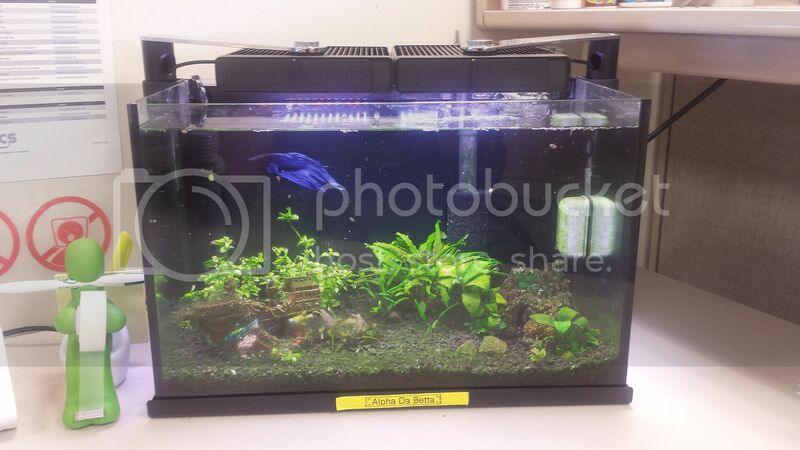 Does anyone keep a tank at the office or workplace? If so what size tank, stocking. How do you handle maintenance and any interactions with the tank and coworkers? I keep a 5 gallon on my desk. With a single betta. rank has been up for about 6 months. Light is on a timer. Has a heater and is heavily planted. Luidia, repens, crypts, and anubias nana. I keep liquid test kits in my desk and do water changes when the nitrates call for it. Usually every three weeks or so. There are several poeple in my office that will stop by and make baby faces and noises at the tank. Keeps me amused. I had been warned about coworkers overfeeding when i brought up the idea at my LFS but with how clean my water tests have been it looks like this is not an issue when i am out. I work as a SAHM so Ihave lots of tanks in my workplace. pufferghoti has 2 tanks in his home-office in the basement which are 2 of my tanks. My bettas marina style 5 in the office. Aquaclear 20, aqueon heater, and 2 fluval lights. Plenty of cover under the plants and two decoration caves he likes to hang out in.